The best of both worlds in one place! Click to learn more! You can join more than one program! There are 3 different programs, just for you! I’m super excited to share with you these new Maintenance Packages and hope that one or more fit your blogging needs! Once I have access to the promotional information from the customer websites (i.e. Stampin’ Up! ), I begin the updates (I’m in NY, Eastern Standard Time). This service is available for all stamping business owners, in any country. Please take note that all Stamping and Blogging Members will have access to the Code/Image Only Maintenance inside the Stamping and Blogging website! There are videos as well to show you how to add the promotional items to your blog’s sidebar. So you no longer have to pay for your membership AND then blog maintenance. It will all be there for you in one place and at the great price of $14.95. You get the ENTIRE site (over 460 videos, 2000+ images) and maintenance! This is a great new option for those who are blog-savy and comfortable with HTML code and adding new widgets to their blogs. In this new package, you will be provided all the HTML code for all the new promos, catalogs, products and/or featured products each month. Then you can copy and paste the code into your blog and or newsletters! You decide how many buttons you want on your sidebar each month and which promos you want! Change them up 1/2 way through the month. You have great flexibility with this program! But please do not share them with fellow demonstrators or downline. The price is right! Instead, encourage them to join! Thank you. For those that would like me to manually update their site for them every month for them. This includes updating, but not limited to, add/removing widgets, updating WordPress, updating WordPress plugins, adding/removing plugins, adding badges, and other smaller scale blog changes you may need. Just let me know what you need and I’ll let you know if it falls outside the scope of maintenance and more towards a Blogs Setup & Design. For those joining this program, make sure you complete this form (click here). Stamping and Blogging ia a unique, premiere site full of stamping and blogging tutorials, videos, tips and more! Now, as part of Stamping and Blogging, you have access to our entire site! 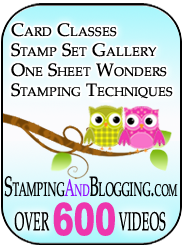 We have a dedicated section “For Stampin’ Up! Demonstrators” and in there an area called “Blog Maintenance”. There you will find the HTML code (equivalent to the non-members using the Code Only Maintenance program described above) and you will have links to videos to help you update your blog! All for $14.95 a month! Click here to learn more about Stamping and Blogging! that you will NOT share the subscription-based code with fellow demonstrators (or your downline) or post in any online groups or forums; and will not copy, sell, distribute or publish without authorization.